Metal decoration techniques started as an experiment through which smiths aimed to innovate and better their sword crafting. During Middle Ages, Europeans used Damasco Technique for crafting their blades. It was in this period that it got mistakenly referred to as “Damasco steel” by Crusaders. During those ages this kind of handcraft proved itself worthy thanks to its exceptional resistance and flexibility, besides its wonderful and characteristic wavy pattern. Examples of Damasco technique applied to jewelry are well known and can be traced since ancient times and from different parts of the world. Damasco technique was in fact used in Marocco, by berbers artisans for their jewels, made in copper-brass and silver, but at the same time was well known and in use also in Indonesia, where can be seen in Java daggers Kriss, made of steel and iron skillfully forged and crafted. In Japan, it was a well-practiced metallurgic technique (Katanas are one of the most notorious examples), and throughout Japanese metal crafting history can be seen a continuous strieve to get new metals and alloys to combine using the Damasco manufacturing of not-ferrous metals. 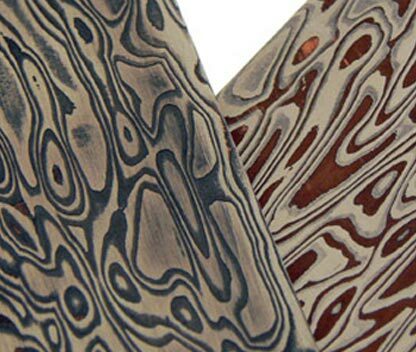 Damasco, when created by layering and bonding precious metals of different colors, has become known with its Japanese name: Mokume Gane (木目金). These words stand for “wood grain metal”. 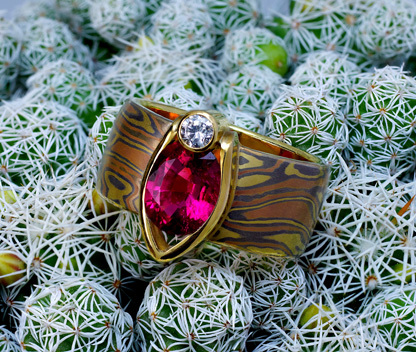 The special beauty of this technique lies in the wide range of colors and shades, that combine Jewelry with Magic and Power. 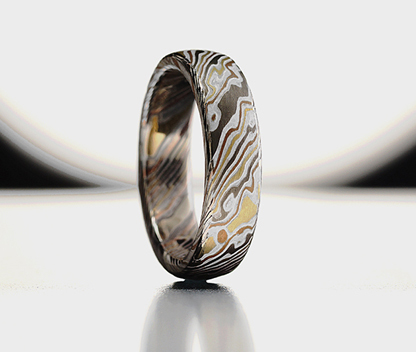 In this ancient technique wonderful patterns are born combining different metals: Silver, Copper, yellow, white and red Gold. Combinations can be almost infinite. This process requires a deep knowledge of each metal used and how they combine together. Several metallurgical studies on each different element involved in the jewel are necessary. In return for these efforts the artisans gets unlimited and unique patterns, created by the metals themselves.